80,000 LBS PER AXLE (5 MPH MAX). 90,000 LBS PER AXLE (5 MPH MAX). 150,000 LBS PER AXLE (5 MPH MAX). RECOMMENDED FOR ALL VEHICLE TYPES AND WEIGHTS. THE ROADWAY SUPPORTS THE WEIGHT (5 MPH MAX). Many highways allow a maximum of 20,000 pounds per axle without special permits. Most rear tractor and trailer axles are designed to support 34,000 pounds per axle maximum. Entire tractor/trailer weights, combined and loaded, typically weigh no more than 80,000 lbs. 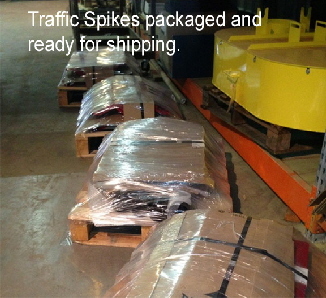 Our traffic spikes are designed to take higher weights, helping them to resist abuse. 4) Motorized or One-Way 5) Warning sign, post, speed bumps. INCLUDE your shipping address with phone number. Lowest deck height in the industry at only 1 7/8” making it easy for low vehicles to cross. 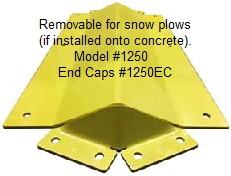 The closest competing product has a deck height of 3”, allowing bolts to be sheared off by low vehicles. TireShark InGround (flush mount) Tire Shredders. Almost no cutting for installation! Ready to use in just 2 hours. 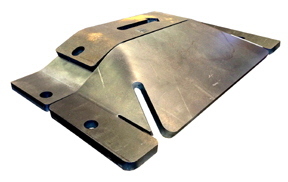 Utilize HD epoxy under the flanges while the road supports the vehicle weight. E-Z! 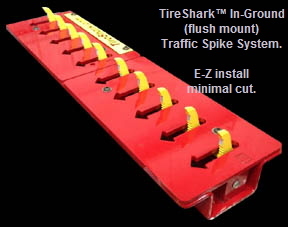 This is a photo of the 1/2” thick TireShark 5000’s end cap, fitted against the end of a spike section. This is the world’s strongest system, SpikeZilla. Your products will arrive in great shape, ready to install. You can right-click on the specification sheet to the left, then select PRINT to have your own computer print this information. Call Stacey right now for pricing and availability. We have a no-hassle sales approach to solving your parking access control needs. Click image for quick details. 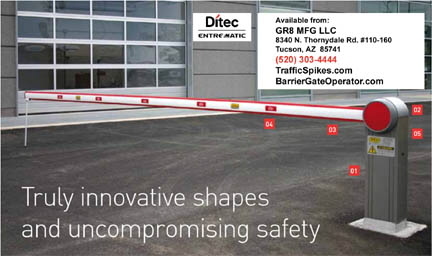 This type of system is available as in-ground or surface mounted as part of a corporate or government installation in need of secure traffic control. 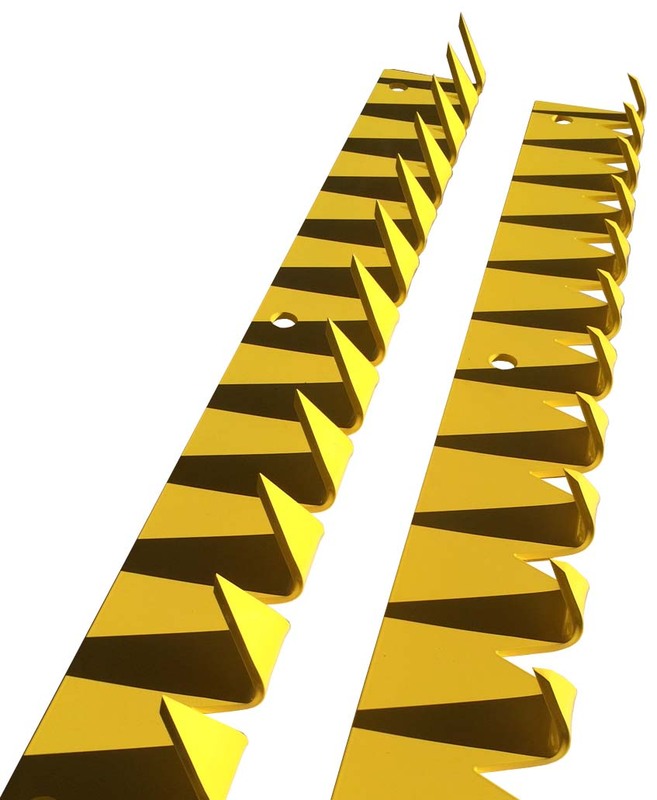 They are designed to puncture the tires of offending vehicles traveling in any direction if the spikes are in the upward position. Spikes may be actuated by switch, card reader, or sensors. It is common for these types to be un-manned and automated (airports and large parking garages). This type of system is easily mounted to the surface of the pavement as part of a community or parking garage installation in need of one-way traffic control. They are designed to puncture the tires of offending vehicles. This type of system is frequently built into the pavement as part of a corporate installation in need of one-way traffic control. With low height speed bumps, this type is ideal for parking areas with high performance vehicles and limited ground clearance. They are designed to puncture the tires of offending vehicles. 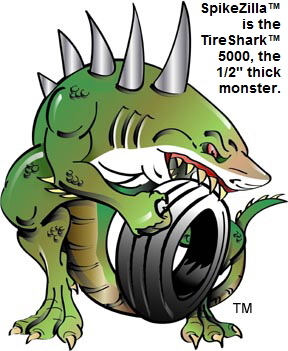 TireShark is a Trademark owned by GR8 MFG LLC. For those seeking to learn more about access controls, further information can be read below and much more is available on the internet. Please feel free to contact us to learn more about traffic systems and access controls. 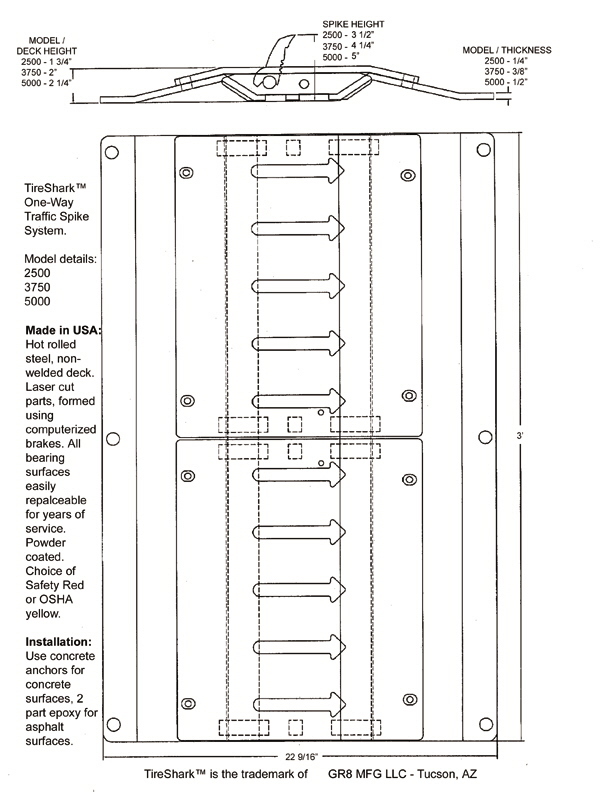 Prior to designing our own products, we offered products by Antech, Guardian Traffic Systems, and DoorKing. We began to manufacture our own, since other manufacturers’ products proved to be inferior AND a main supplier had refused to honor a serious warranty issue. We respect our customers! 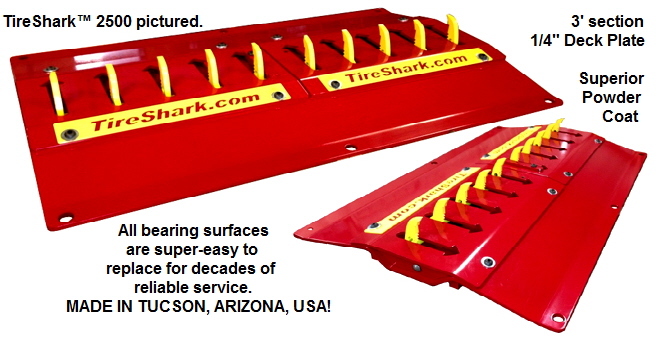 Many call our products tire killers or tire rippers. Some purchasing managers consider our products to be MRO or relating to maintenance, repair and operations. An access control, which can be a set of tire killers, shredders, a door, turnstile, parking gate, elevator, or other physical barrier where granting access can be electrically pr automatically controlled. Typically the access point is a door or traffic access mechanism. An electronic access control can contain several components. At its most basic there is an electric lock. The lock is unlocked by an operator with a switch. To automate this, operator intervention is replaced by a reader. The reader could be a keypad where a code is entered, it could be a card reader, or it could be a biometrics reader. Readers do not usually make a decision but send a card number to an access control station that verifies the number against a pre-approved access list. To monitor the door position a magnetic door switch can be used. A door switch is not unlike those on freezers or car doors. Generally, only entry is controlled and exit is uncontrolled. In cases where exit is also controlled a second reader is used on the opposite side of the door or traffic control mechanism. Traffic control mechanisms can be one-way or motorized. In cases where exit is not controlled (free exit) a device called a request-to-exit (REX) is used. Request-to-exit controls can be a pushbutton or a motion detector. When the button is pushed or the motion detector detects motion at the door, the door alarm is temporarily ignored while the door is utilized. Exiting a door without having to electrically unlock the door is called mechanical “free egress”. This is a safety feature. In cases where the lock must be electrically unlocked on exit, the request-to-exit device also unlocks the door. There are many generic ways to describe these types of parking lot security products. Tiger Teeth, Cobra, Cobra II, Enforcer, Guardian, 1230, 1236, 1130, 1160, 1167, and Sabre Tooth Controllers (Saber module) are generic words that have been in use for decades to describe these (tire treadles). We can supply any of these to you. TireShark brand are exclusively available through GR8 MFG LLC (contractors, dealers, and distributors are welcome). In America, we have a lot of spirit! Our product is creative and used for buildings. Anti-terrorism and force protection are the name of the game. Control the road. Pop offenders’ tires. Guardians can be road blockers, tire spikes, traffic controls, spring loaded and mechanized systems, snares, Cobra, Cobra II, Enforcer motorized systems, electro mechanical, speed bumps, and signs. Remote access controls can apply to active, passive, entry, egress, and road lanes, both one way, two way, 1, 2, and across lanes. Architects and civil engineers (planning and planning services, plus contractors) use blueprints to specify our speced (specified) products for any complex, parking lot or garage and shopping mall. 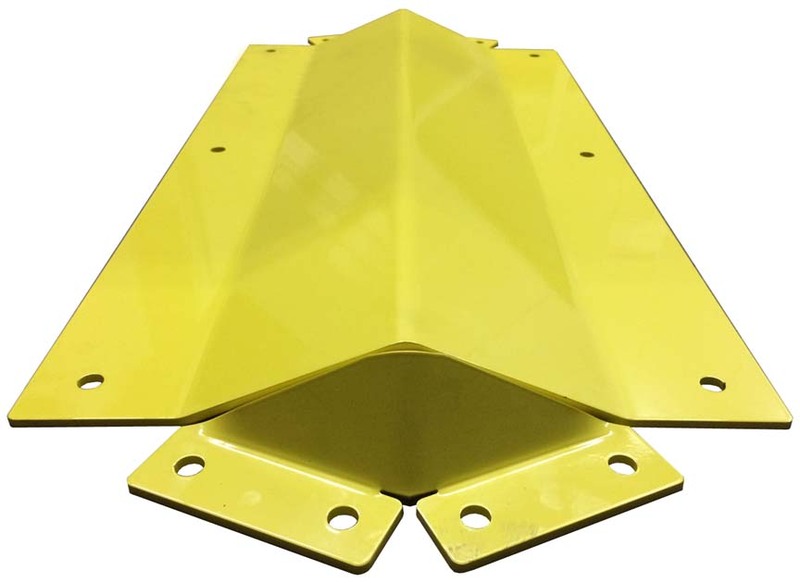 Our Enforcer and Protector series, StingRay work hand-in-hand with traffic technology, electronic, road construction, traffic control, highway safety, auto transport, transportation, pavement, asphalt, concrete, contractors, installations, and parking lots, both commercial and private. Customers include individuals, military bases, apartment complexes, shopping centers, airports, businesses, manufacturing plants, manufacturers and manufacturing plants. Our products are made with steel, and can be galvanized, but typically have plated tiger teeth (shredders). Like crazed engineers with worn pocket protectors, we constantly strive to make improvements in our product line. 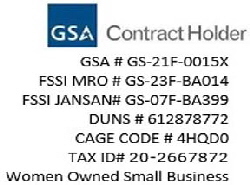 Our TT-36 product line (tiger teeth) is the same product type that we have seen described with a GSA #: GS-07F-9574F and Part #: DC36-LD. Autos, cars, trucks, and pedestrians (foot traffic) can utilize Cobra II, Enforcer, and StingRay. 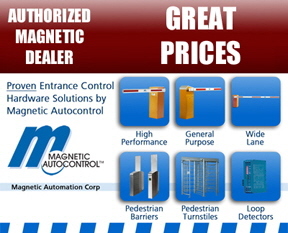 We offer an excellent warranty on our traffic access control products, access control systems, access control security system, security access control, card access control system, biometrics, access building control security system, access control gates, self storage access control, fingerprint access control, access control keypad, remote access control, proximity reader, role based access control, building access controls, fences (fencing), and ornamental gates. We don’t supply chain link fence or steel wire fence, but do offer dog kennels, gate opener, sliding gate operator, and electric gates. We don’t make pvc fence, plastic fence, vinyl, wood, ornamental, or temporary hardware. Our super heavy duty posts are used in security areas, farms, ranches, stadiums, sports fencing installations, retail, and contractor yards. Aluminum is usually not used, but galvanized steel, fittings, hardware, bolts, and rails, also painted, are used. Use of Google (a corporate customer of ours that has purchased from us in the past for their corporate parking lot) and other search engines can yield a vast array of knowledge pertaining to access controls. when you perform the search, and it involves multiple words, put the search terms in quotes “ “ like this: “traffic control”. This will narrow your search and make it more effective. We ship our access controls products to all 50 states and more: Wyoming, WY, Wisconsin, WI, West Virginia, WV, Washington, WA, Virginia, VA, Vermont, VT, Utah, UT, Texas, TX, Tennessee, TN, South Dakota, SD, South Carolina, SC, Rhode Island, RI, Puerto Rico, PR, Pennsylvania, PA, Oregon, OR, Oklahoma, OK, Ohio, OH, North Dakota, ND, North Carolina, NC, New York, NY, New Mexico, NM, New Jersey, NJ, New Hampshire, NH, Nevada, NV, Nebraska, NE, Montana, MT, Missouri, MO, Mississippi, MS, Minnesota, MN, Michigan, MI, Massachusetts, MA, Maryland, MD, Maine, ME, Louisiana, LA, Kentucky, KY, Kansas, KS, Iowa, IA, Indiana, IN, Illinois, IL, Idaho, ID, Georgia, GA, Florida, FL, District of Columbia, DC, Delaware, DE, Connecticut, CT, Colorado, CO, California, CA, Arkansas, AR, Arizona, AZ, Alaska, AK, and Alabama, AL. We do international shipping as well. There are many ways to describe our products. The following pages help some people see that their descriptions of our product are accurate. We also added a few with silly pictures to make your time here more fun... check them out. Other pages include: Our European website: FlowPlates.com (some items priced in pounds for UK visitors). Tiger Teeth. 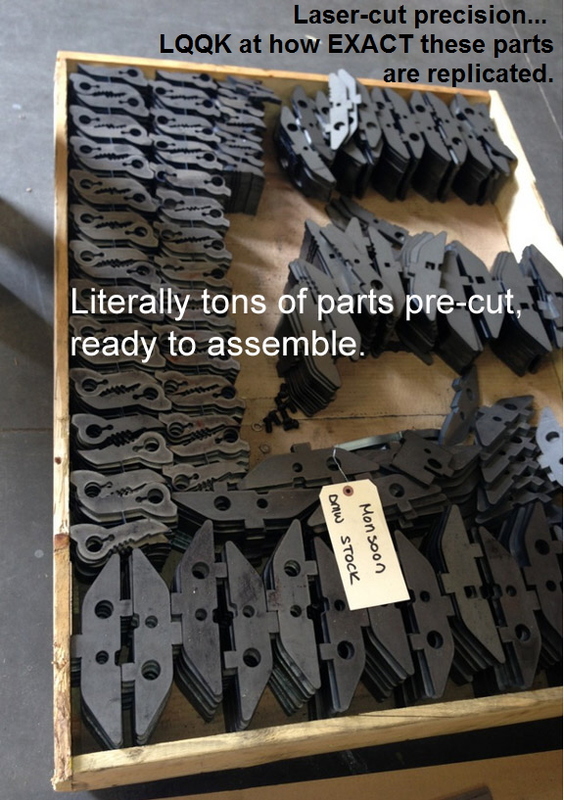 We reserve the right to alter design specifications without prior notification (we upgrade finishing techniques and manufacturing processes as they become available). 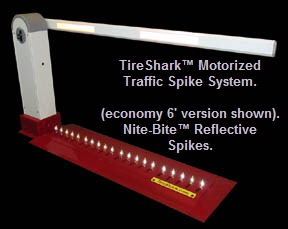 *25 year warranty covers manufacturing defect only, as determined by the manufacturer; TireShark brand traffic spike sections only; wear items, such as springs and bearings are not covered, but are easily replaced. 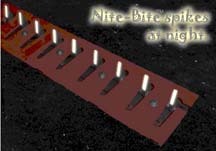 It is rare that a broken spike is due to defect, it is usually caused by speeding vehicles. 5 mph max. 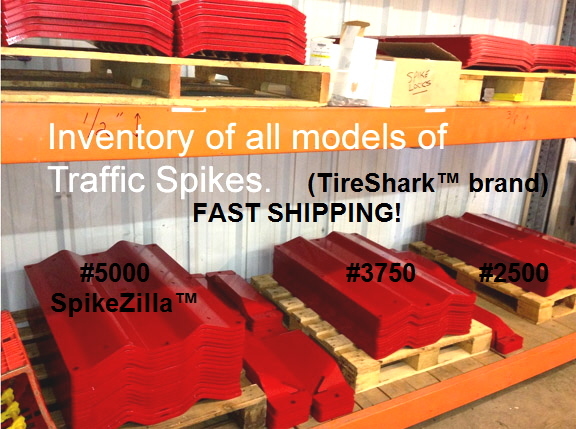 Warranty begins on TireShark traffic spike sections purchased after 10/3/2014.